Saturday was spent celebrating my son’s birthday, which was LEGO themed this year. He had a blast. Along with that, our friends Nick and Laura were in town. 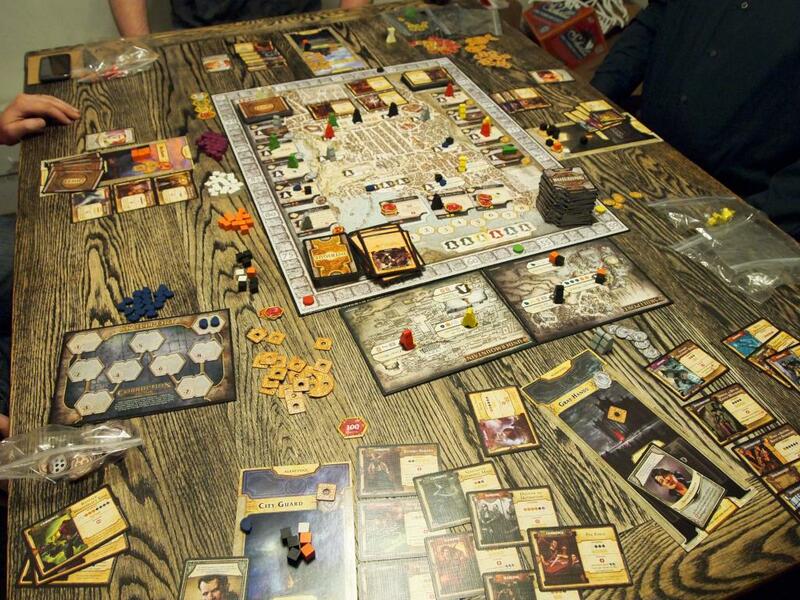 We were joined by Kevin, Louis and Joe that evening for a game of Lords of Waterdeep with the expansion. My Lord awarded a bonus for each corruption I had at the end of the game, so I focused on completing high point quests using said corruption. I was expecting the game to be similar to last time where most everyone was sitting on a fair bit of corruption, but boy was I wrong. There were a few quests that reduced corruption and a couple of buildings were built later that helped as well. I did managed to build a decent lead, but stalled in about the sixth round. Laura was able to overtake me and jumped out to a huge lead by the end. Nothing is ever as it seems, though, and she didn’t have a enough end game bonuses to counteract the few corruption she still had. Louis — on the other hand — had a bunch of end game points and finished in first. I lost 32 points from my corruption even after my Lord bonuses and ended up in fifth, just ahead of Nick. 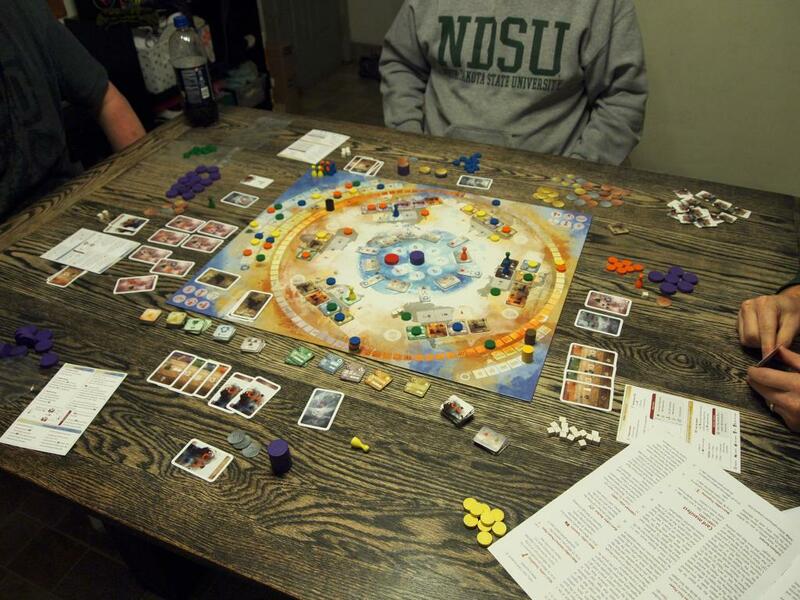 Gina joined us and we played 7 Wonders with all of us. I was playing Babylon, and somehow managed to get a ton of Science cards. I did poorly in all other categories, but I had a bunch of science plus my wonder and the guild card that let me choose which science icon to score. After a little help from the others choosing which icons to score, I managed to beat Louis and his Giza wonder by only a couple points. Gina wanted to finish the night with Flash Point. Joe sat out and just observed. 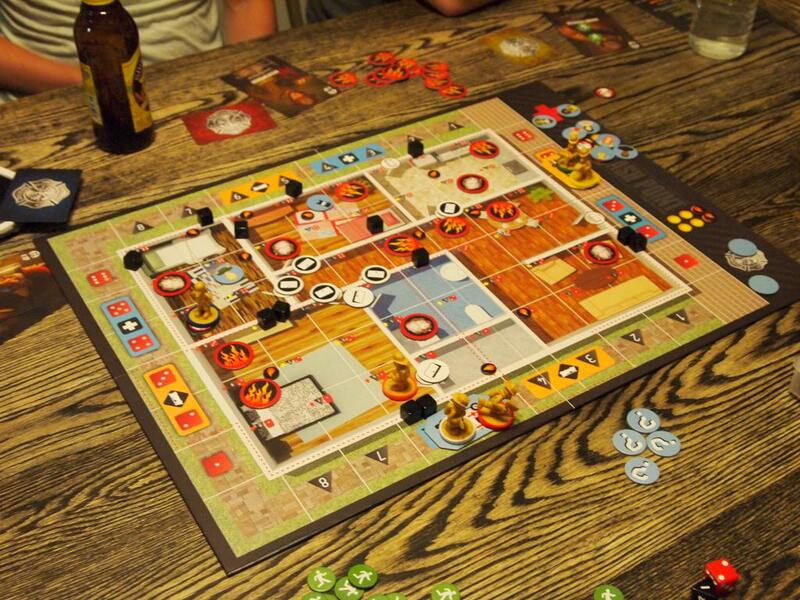 We used the more challenging of the two base game maps and had all but the medic and commander roles represented. 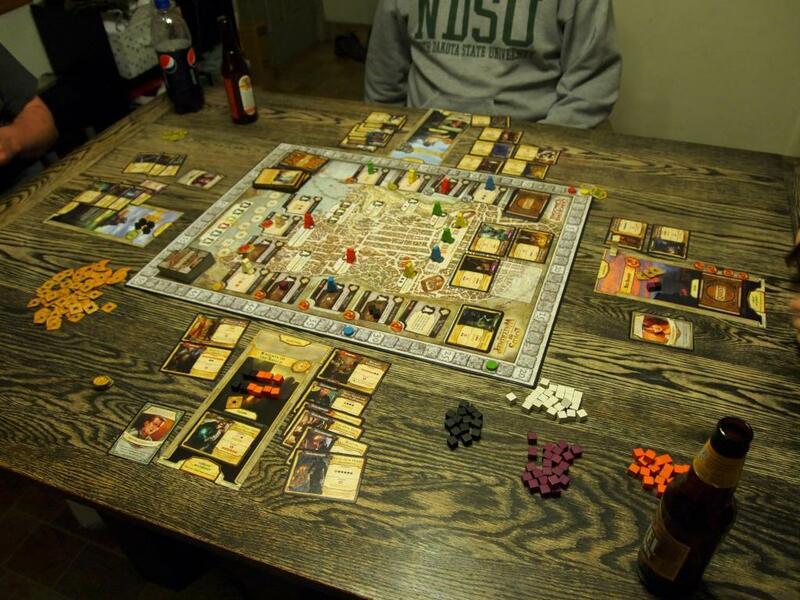 It ended up being a fairly quick and straightforward game. Louis was working the deck gun masterfully and hit nearly every time. The fire was constrained to one side of the building, while the victims were typically on the other. Nick kept the hazmat to a minimum and we quickly cleared the house of victims with zero casualties. 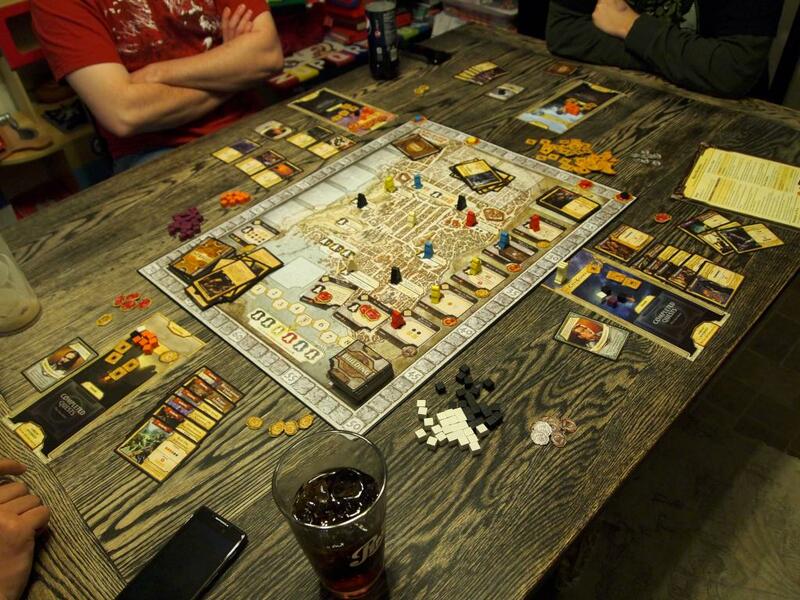 We had Dana, Louis, and Kevin over Saturday and kicked things off with Lords of Waterdeep. It was a very close game throughout. Kevin and I got out to early leads, but the others quickly caught up. I was trying to complete a number of arcana and warfare quests, but they all required clerics, that were hard to come by. Louis was building like crazy, and we were all pretty sure he had the Lord that gave bonus points for doing just that, but there wasn’t much we could do to stop him. I was able to complete a big piety quest for 25 points and had a 28 points from my lord, but that only put me just in front of Dana. Kevin had the most quests requested by his lord, but Louis had the huge bonus with eight building and a six point bonus for each from his lord. His 48 points just crushed the rest of us. 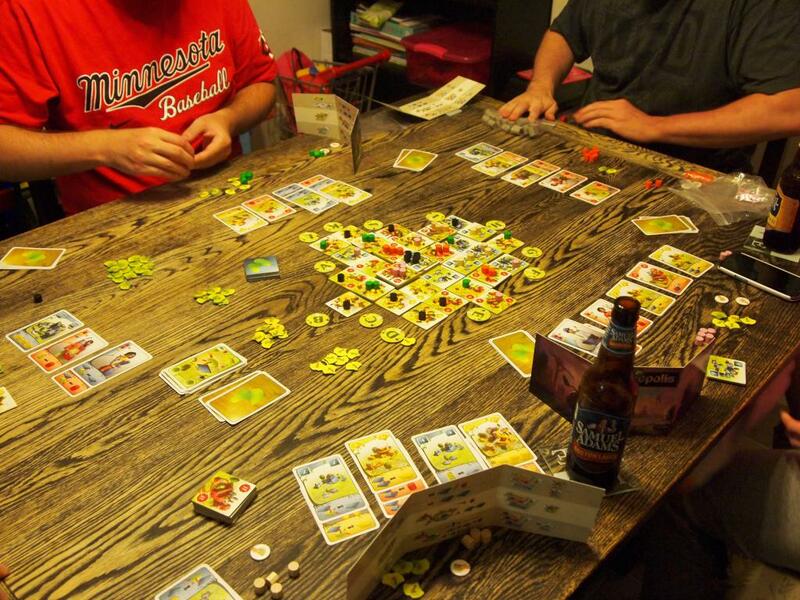 We followed that up with Keyflower. After a brief refresher, we were off. 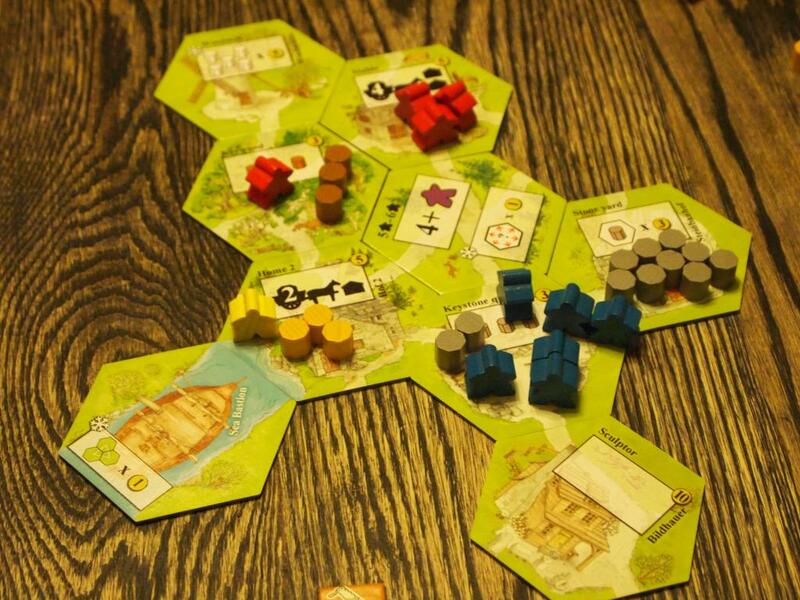 I quickly went for big wood and stone production tiles in the first season to set me on my way. I didn’t grab anything in the summer, but did use my buildings for upgrades and to prepare for a strong fall. Louis and Dana were working with green workers and Kevin had a bunch of gold. In the fall, I was able to use my horde of blue minions to secure the statue and stone mason that would use the stone stockpile that I had been building. The winter tiles didn’t matter much to me, so I primarily worked to gather stone and move it to my stone mason for the bonus points. 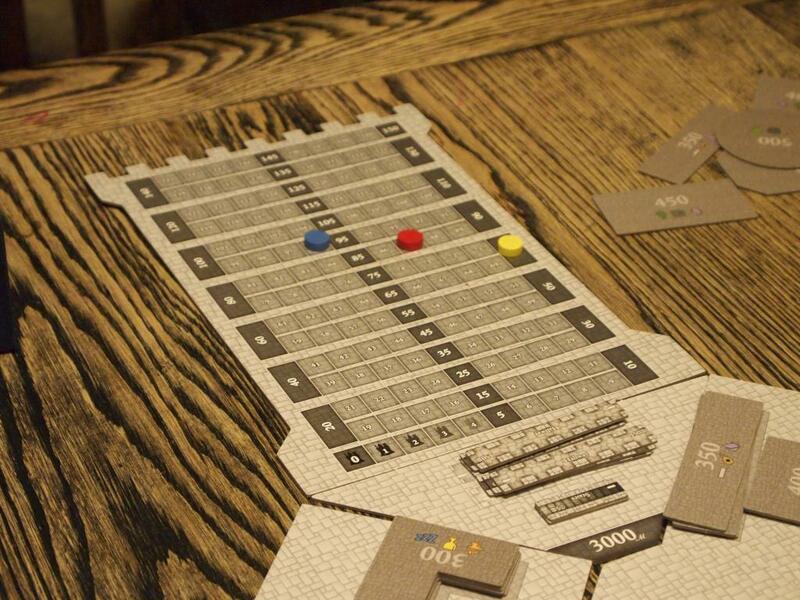 I would have liked to grab the keythedral, but Kevin edged me out on that bidding. In the end, I had 27 points just from my stone, and 76 total for first place. 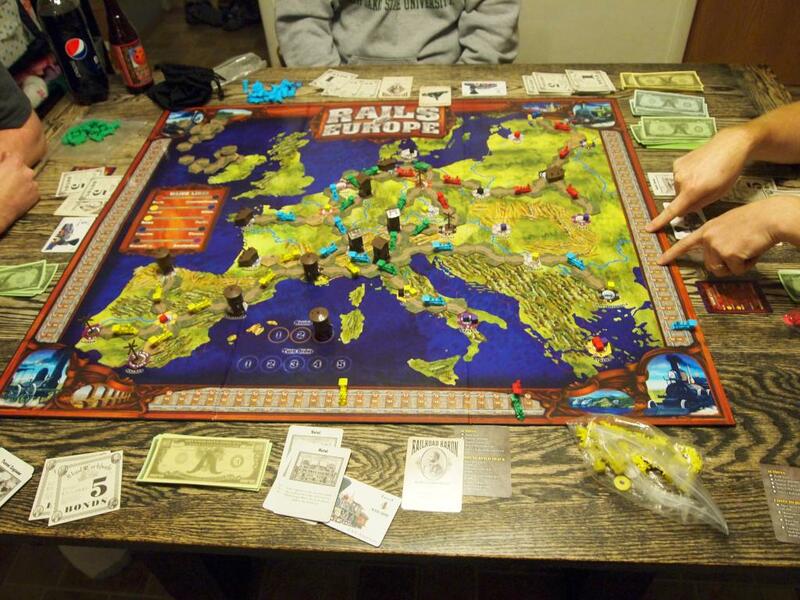 Louis, Kevin and Joe joined me in playing Railways of Europe Saturday evening. My baron gave bonus points for connections to Spanish cities, so I started the game with the intent to work that area. The Madrid to Milan major line was an easy way to get some starter income, plus it provided a number of cubes to deliver. I wasn’t able to get the first 3-link delivery, though, and that ended up going to Louis. They were all over the center of the map, and everyone had decently upgraded trains with large deliveries. 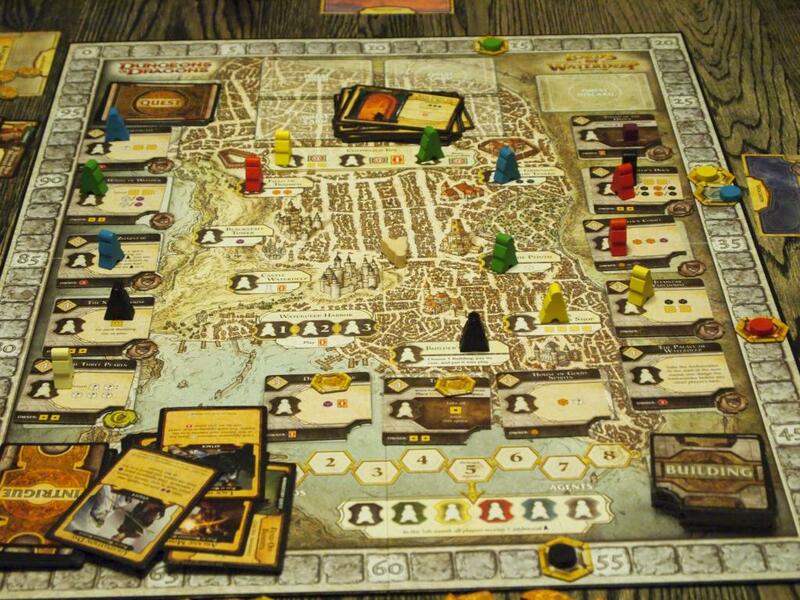 Joe had connected in the Russian areas, while Louis managed to connect Paris to Constantinople for the bonus. Things were very close throughout, and everyone was sitting with 10 or 11 bonds. 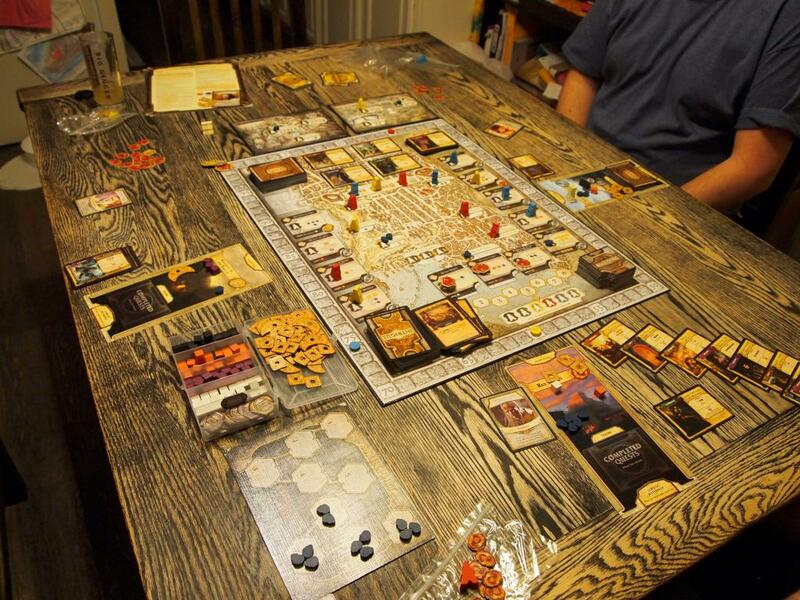 I had run out of good deliveries by the end, and was reduced to two point deliveries on the last turn. While I had the most points from my baron, it wasn’t enough to overcome their leads. Louis’ deliveries set him apart, and he ended up taking the win. 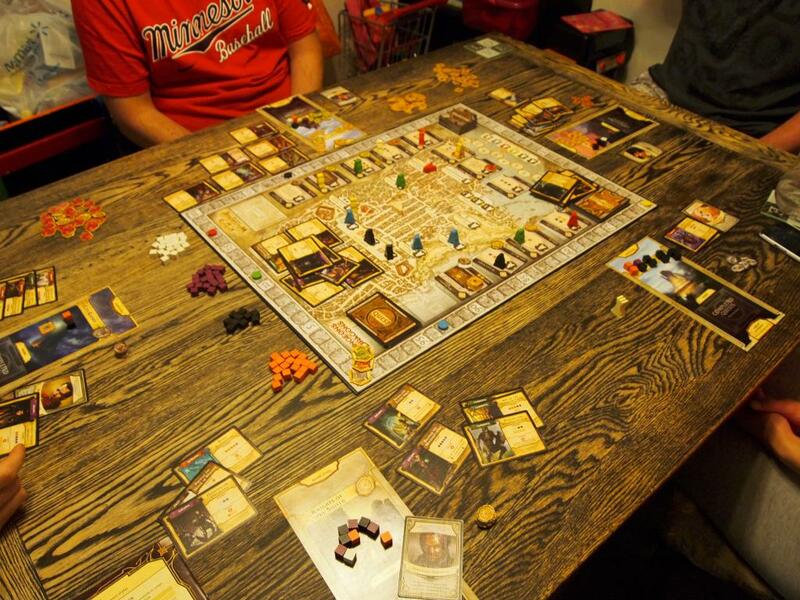 We followed that up with Lords of Waterdeep. Louis and Kevin jumped out to big leads with a couple nice quests, so I hit Kevin with his second mandatory quest. I had intended to give Louis one as well, but ran out of actions in the Harbor to make it worthwhile. I had one 25 point quest available, but it required nine warriors to complete. I did managed to complete another quest that provided me with six of the warriors and was able to get another two on the last round. That last warrior eluded me, though, and I was never able to complete the quest. Louis’s quests all satisfied his Lord, and because of the mandatory quests slowing Kevin down, Louis was able to take off with the win. We finished the night with CO2. 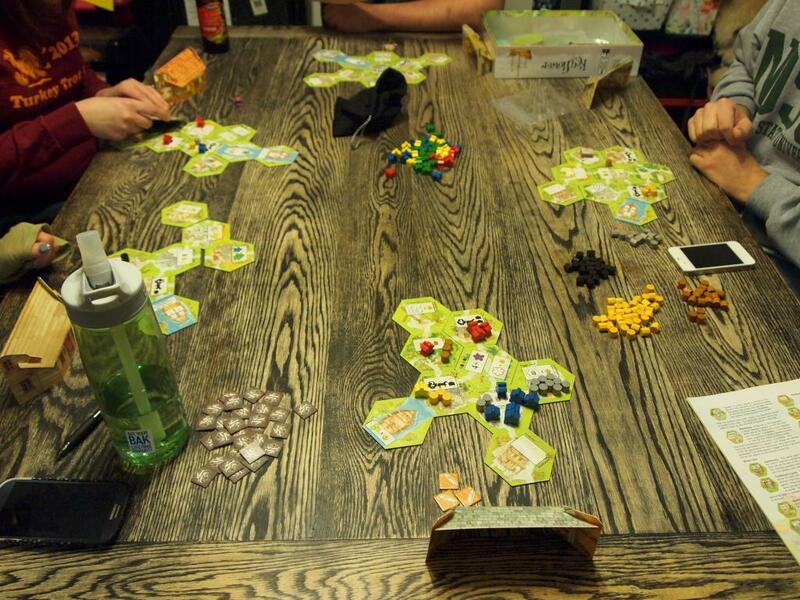 The game started with 210 PPM of CO2, so we got to constructing clean plants right away. I was focused on Biodiesel and Recycling mostly, though I did manage to construct a couple Solar plants that Joe so kindling proposed and installed. I had completely forgotten about the UN goals until Kevin mentioned them, so I missed out on opportunities to get them early, but I was able to grab the two that I qualified for. Had I been thinking about them, I would have worked harder to construct a Nuclear plant to satisfy a few more goals. We were progressing quite well, with Oceania and Africa nearly completely developed. 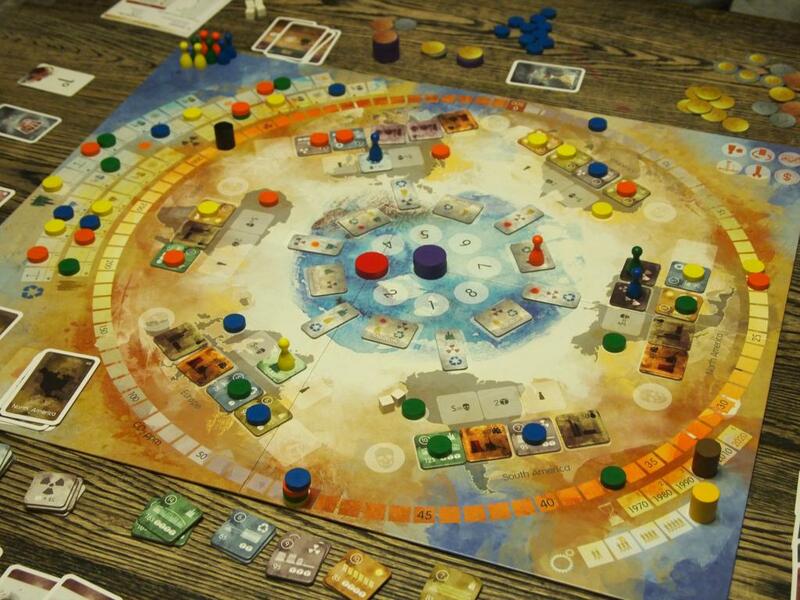 We had stemmed the growth of CO2, and it was looking good that we could finish the game a turn early. Looking at the scores, I was doing well, so I decided that building the solar plant in Africa to drop the CO2 level and end the game was the best course. I hadn’t taken into account the shear number of CEP tokens that were available in the countries that Kevin controlled, though. He scored about 28 points from those alone, rocketing him into first place. 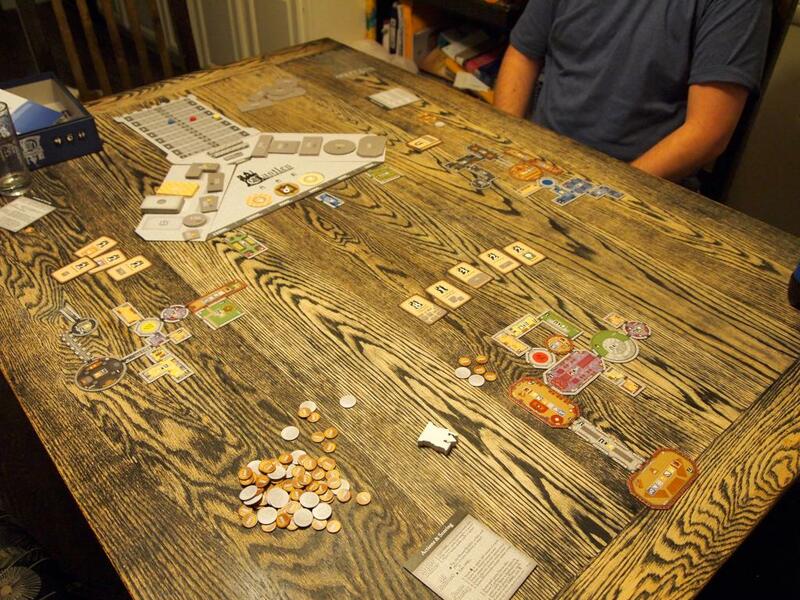 We did manage to play the game slightly wrong, forgetting to pay CEP’s for the “dirty” power plants each turn. Just one of the issues with a complex game that doesn’t get played often enough. The wives were all out of town this weekend for a shopping trip. So Saturday night was just Ryan, Kevin, Louis and myself. 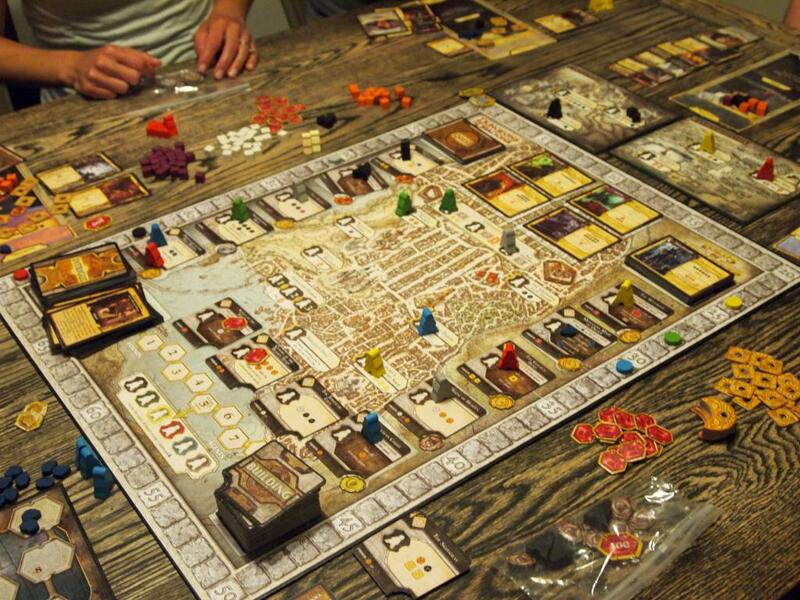 The night started out with Lords of Waterdeep. 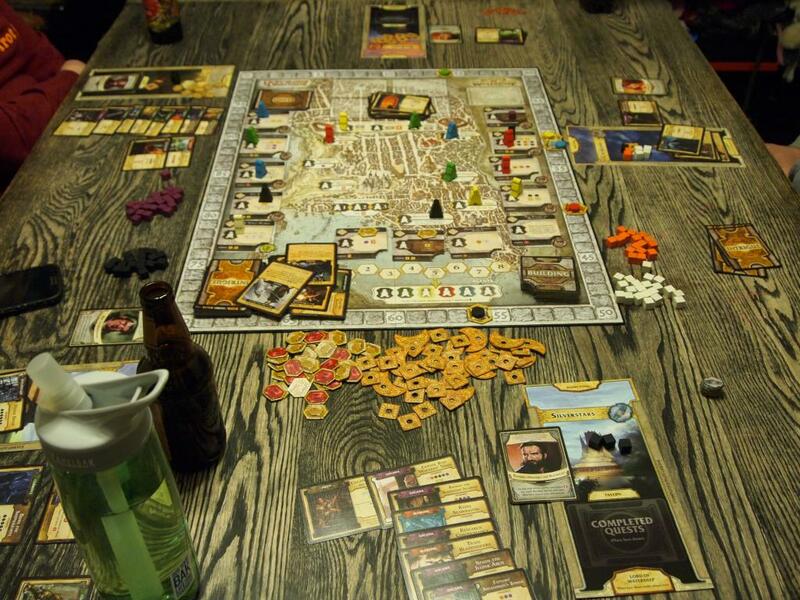 Louis and Kevin got out to a quick lead with some big quests, while I was struggling to find quests that would appease my lord. Ryan was lagging behind, but just biding his time. 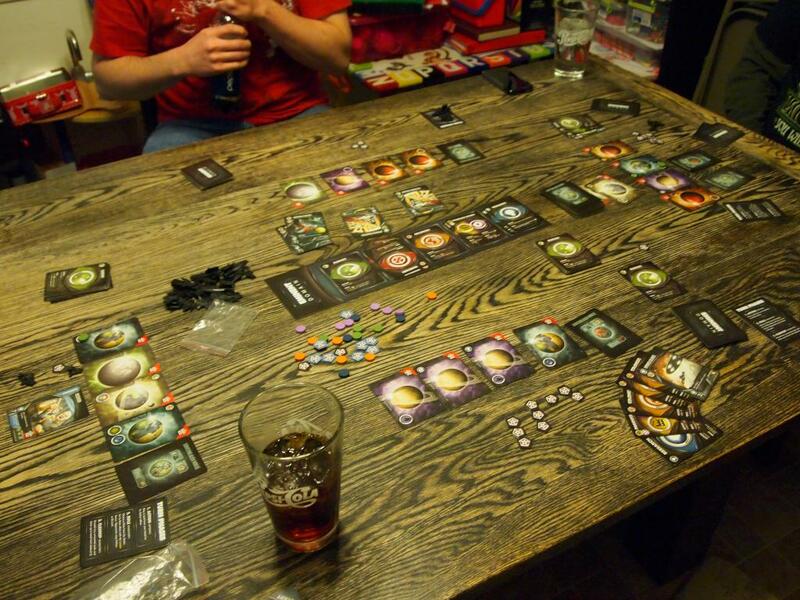 Eminent Domain was the second and final game of the night. I wanted to get into the Produce/Trade side of things, but it was pretty slow going. Louis was doing it a bit more efficiently, early on, but I had a couple good turns toward the end where I was able to catch up. Ryan was pushing a Research game, but had one hiccup with the wrong king of planet that slowed him down. Kevin was pushing the military hard, but wasn’t surveying a ton of planets. The final score ended up being very close. 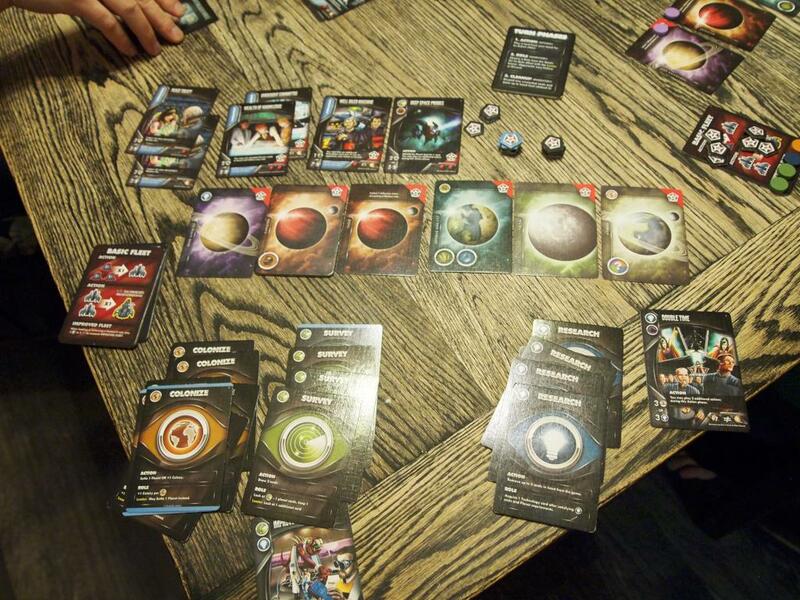 Kevin had 18 from his planets and Ryan had 20 from planets and research. 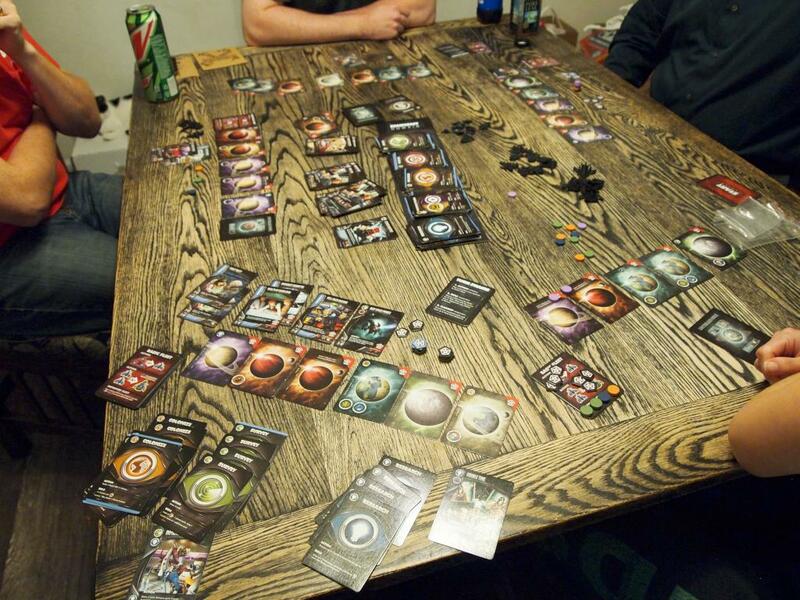 Louis and I had nearly identical boards, but I had one more Influence chip and one of my planets was worth a point more. He finished with 20 and I had 22 for the lead.d showing up, and I was able to complete a bunch and sneak into the lead. 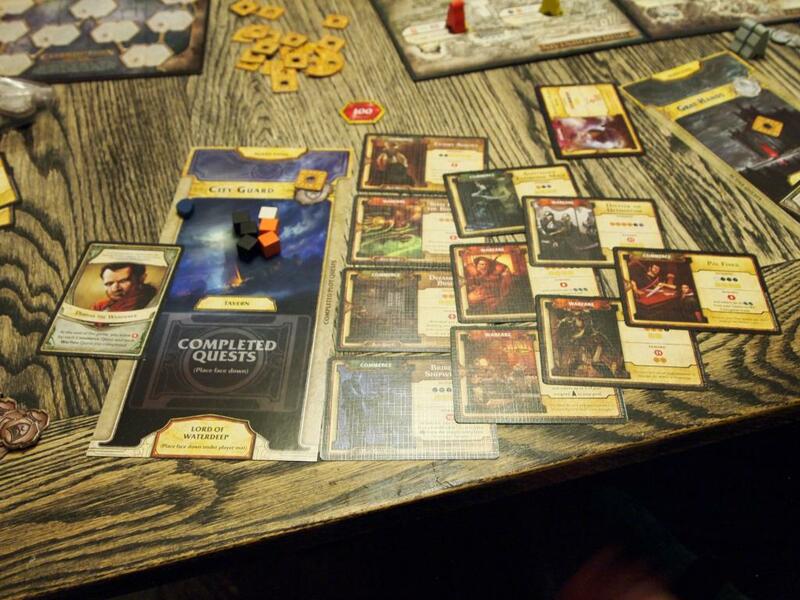 Ryan was positioning himself for a huge quest turn-in, but Louis ended up getting in the way. At the end, my Lord gave me just enough to edge out Kevin for first place, followed up by Ryan and Louis.